The things in the tool box that have the greatest effect on the way we work are more often than not the most basic items. Take the Saddle Tail from Sterling Tool Works for example. Designed to simplify the marking out of dovetails they provide angle and square reference edges to scribe a line or pencil mark in a single tool. Very neat indeed. They are available in 1:4, 1:6 and 1:8 patterns directly from the makers in the USA. By his own admission, Chris Kuehn, proprietor at Sterling, acknowledges that they're not a budget item and there's a good reason for that. They're not produced in anything like big quantities but to an engineered standard befitting their task; an appealing notion for craftsmen in the habit of supporting fellow craftsmen. Made from O1 tool steel and a brass alloy they're finished to an extremely high standard and sit comfortably among the growing list of quality tools for cabinet work. Now I'm a 'tails first' man but the most logical way to use the Saddle Tail is to mark the pins first, only because the annotation and beautifully stamped Sterling Tool Works emblem is facing you. 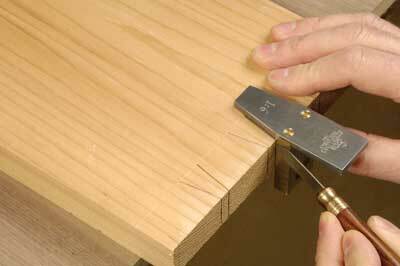 It works just as well with the board laid flat on the bench as it does upright in the vice. A tiny amount of material has been relieved at the junction between the two components to accommodate any issues arising from a fluffy arris. You could say they've thought of everything. Whatever your preference, tails first or pins, the Saddle Tail will help you achieve a uniform pattern of crisp dovetails.